Nifty moves 150 points in a day !! After a quick drop 2 days back Nifty has now crossed into new highs for the year and trapping the shorts. This is mainly the reason one needs to stick to the trend. 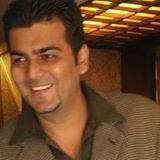 For us at Analyse India there are couple of interesting things which happened. 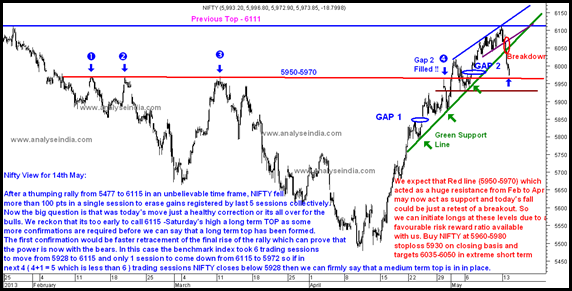 In our daily newsletter service we do send a daily Nifty view / Trade idea if any. -> We initiated a buy at 5960-5980 spot levels for a target of 6050. After a thumping rally from 5477 to 6115 in an unbelievable time frame, NIFTY fell more than 100 pts in a single session to erase gains registered by last 5 sessions collectively.Now the big question is that was today's move just a healthy correction or its all over for the bulls. 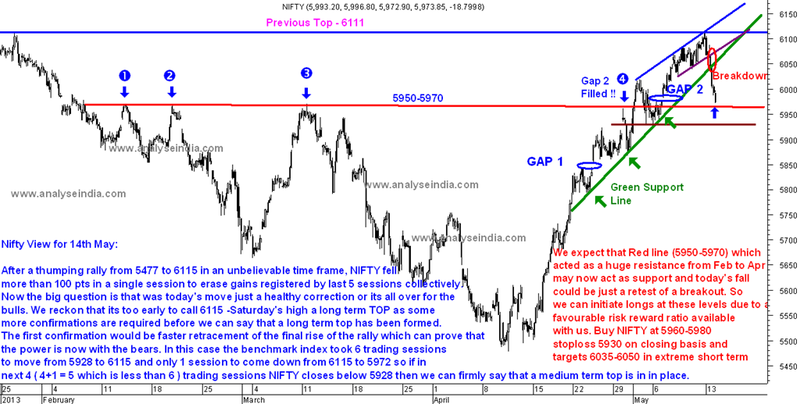 We reckon that its too early to call 6115 -Saturday's high a long term TOP as some more confirmations are required before we can say that a long term top has been formed.The first confirmation would be faster retracement of the final rise of the rally which can prove that the power is now with the bears. In this case the benchmark index took 6 trading sessions to move from 5928 to 6115 and only 1 session to come down from 6115 to 5972 so if in next 4 ( 4+1 = 5 which is less than 6 ) trading sessions NIFTY closes below 5928 then we can firmly say that a medium term top is in in place. We expect that Red line (5950-5970) which acted as a huge resistance from Feb to Apr may now act as support and today's fall could be just a retest of a breakout. So we can initiate longs at these levels due to a favorable risk reward ratio available with us. Buy NIFTY at 5960-5980 stoploss 5930 on closing basis and targets 6035-6050 in extreme short term. Now comes the fortunate part. -> We were short Bank Nifty and made around 150 odd points and covered at 12500-12550 levels and is now at 13000 :). -> most importantly WE are NOT SHORT 🙂 in this sharp bounce of almost 200 points. This is how trading works – You cannot make full part of every move and sometimes totally miss out but if you can consistently trade low risk-reward opportunities the quarterly returns do look good. Follow the trade plan , wait for the next opportunity and stay disciplined. Right now we have no trade on Nifty but we wont be hesitant to short/long in next few days if the technicals and risk-reward point to the same.